Nothing beats gas for ease of use and temperature control. You can be ready to go at the flick of a switch and using gas gives you the ability to cook anything from loaves of bread to pizza and steak. With easy attachment to the rear of your Uuni Pro, simply slide on, insert the 2 screws and you're ready to connect to the gas source. 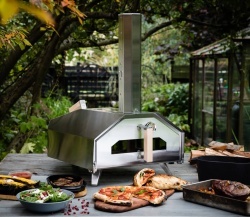 The Uuni Pro Gas Burner is for use with the Uuni Pro Quad-Fuelled Oven only. This product is not suitable to use with any other Uuni ovens.